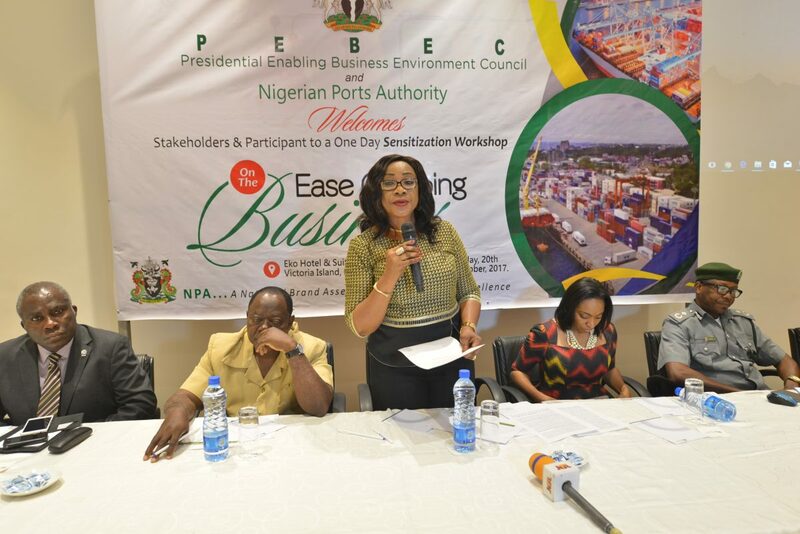 The representative of the Managing Director of the Nigerian Ports Authority (NPA), General Manager, Servicom, Mrs. Carolyn Akum Ufere (Middle) presenting the MD’s speech, the special Assistant to the President on Industry Trade & Investment enable Business Environment Secretariat Coordinator and also Secretary of PEBEC, Dr. Jumoke Oduwole (2nd from right). Representative of the Director General of Standard Organization of Nigeria (SON), Engr. Makwe Chika Mathias (2nd from left). The Deputy Comptroller of Customs, Anthony Ayalogu (right) and the National Vice President of Association of Nigerian Licensed Customs Agents (ANLCA) Emeka Nwokeoji, at a one – day Sensitization Workshop on Ease of Doing Business held at the Eko Hotel & Suits, Victoria Island, Lagos.